About 193 million Indonesians are eligible to vote in presidential and legislative elections on Wednesday that will decide who leads the nation. In the final moves of Indonesia's presidential campaign, one candidate dashed to Saudi Arabia to meet its king and perform a minor pilgrimage. The other attended a feline photography exhibition and giggled with delight at a giant photo of his own pet cat. For the world's most populous Muslim-majority nation, the message intended by President Joko "Jokowi" Widodo's trip to the birthplace of Islam was obvious after a campaign in which conservative opponents tried to discredit him as insufficiently pious. About 193 million Indonesians are eligible to vote in presidential and legislative elections on Wednesday that will decide who leads a nation that's the world's fourth most populous nation, its third biggest democracy and is forecast to be among the world's biggest economies by 2030. TRT World's Natalie Poyhonen is in Jakarta and has this report. 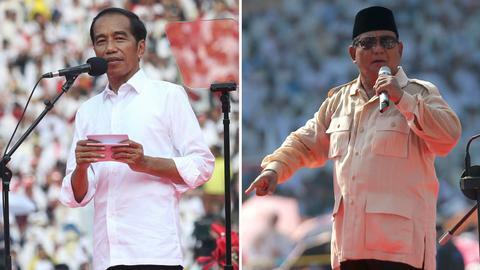 Voters will choose between five more years of the steady progress achieved under Indonesia's first president from outside the Jakarta elite or electing a charismatic but volatile figure from the era of the Suharto military dictatorship that ended two decades ago. Surveys show Widodo with a lead of up to 20 percentage points over Subianto. But the pollsters and commentators are nervous, afraid they might be failing to capture facts on the ground in the same way opinion surveys misjudged the 2016 US presidential election and UK Brexit referendum on European Union membership. The enthusiasm that Widodo generated in the 2014 campaign was far less evident this year apart from a final major rally at a Jakarta stadium which attracted well over 100,000 fervent supporters – about the same as Subianto a week earlier at the same venue. Islamic groups that were behind massive 2016 street protests against Jakarta's Widodo-allied governor have campaigned effectively for Subianto for months, Arifanto said. And there is anecdotal evidence, he said, that some Subianto supporters are not declaring their true voting intentions in surveys. Widodo has tried to neutralise the not-a-real-Muslim whispers with the selection of Ma'ruf Amin, the leading Islamic cleric in Indonesia, as his running mate, though he also risked alienating progressive and moderate supporters. Subianto's campaign released photos of him at an exhibition of cat photos by a Dutch photographer that featured the politician's own cat, 'Bobby', which has a following on Instagram. "Wow is this the photo of Bobby? It's very nice," Subianto said Sunday, pointing at the photo. 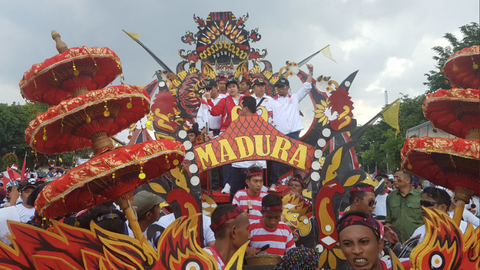 His ultra-nationalist tactics preceded President Donald Trump's polarising rhetoric by several years and the party he founded in 2008, Gerinda, is officially known as the Greater Indonesia Movement. Widodo, meanwhile, has highlighted his progress in improving Indonesia's inadequate infrastructure with new ports, toll roads, airports, and mass rapid transit – which became a reality last month in chronically congested Jakarta. Economic growth has been stable if unspectacular and inflation is low, maximising the impact of poverty alleviation programs. The UN's Food and Agriculture Organization and other international agencies said earlier this month that the percentage of Indonesian children suffering from stunting – malnutrition that can result in lifelong physical and cognitive impairment – fell to 30.8 percent from nearly 38 percent between 2013 and 2018.